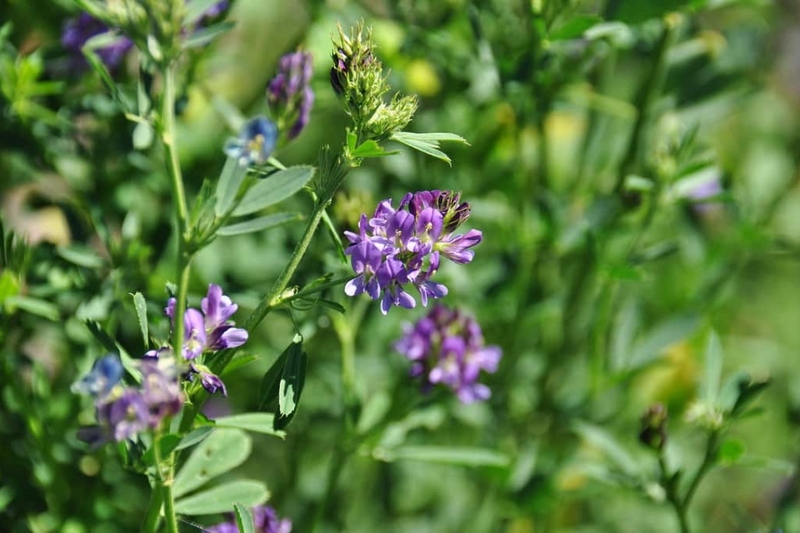 Alfalfa (Medicago sativa): growing, planting, caring. One of the most common forage crop around the world - can be used in the garden as green manure. Full description for Medicago sativa not yet available. Sow directly in open soil in spring or late summer-early fall. Avoid sowing in heavy and compact soil and in acidic soils. After grubbing a vegetable crop, finely prepare the soil with a claw and rake to flatten the soil, break the clods, and pull the coarse elements around the edges. Sow by spreading the leaves on the whole surface. Mixing your seeds with sand helps sowing. Cover with a thin layer of soil, then tamp with the rake. Water gently. Emergence should happend between 8 and 15 days later. Watering is especially necessary the first weeks, and in case of drought. Keep the seedling substrate a bit moist. Once properly installed, water your plants only in dry and windy weather or in case of prolonged drought. After 2-3 months of cultivation, watch the flowering: as soon as it begins, it is advisable to cut the green manure so that it does not form seeds. If you are not going to cultivate immediately at this location, spread the stems on the surface like a mulch. Some advise to incorporate green manure on the surface, but it is less respectful of the soil because it will not be protected from bad weather. If you want to sow something else before the green manure has broken down, tear it up and compost it in a corner, or keep it for mulching later in the season.